Utopia for meat lovers , this gali (street) is full of tiny shops selling fish & meat dishes with strong & rustic flavors & taste at prices that u wud have heard ur grandfather talk about. Address & other details: Just get into an autorickshaw & ask for Chatori Gali. U will b transported there. It seemed as easy as asking any public transport driver in Agra to take u to Taj Mahal !!!! There is a small parking that can accomodate 10 – 12 cars just opposite Chatori Gali – In case u prefer to take a car. prices so low that even ur Grandfather wud compare with his college days. This place is just a road on which there are small shops on both sides that sell YUMM meat & fish products at very low price & high volumes. Everything here is very chatpata in taste – rustic, robust. For those of u who go by the hygiene displayed by the Restaurant / the shop, u will b disappointed. Its different that in the kitchen of many (not all) Restaurants, it is not very neat & clean – the only difference is that u do not get to see that. For those of u who r frightened to eat fried food or food with fat in them, this is not the right place. BUT, if u r one of those who believe in pampering ur tastebuds & then work out harder to burn those extra calories, then this is the place. The people at the counters are quite friendly & ‘to the point’. But as I always say, they do not undergo modern day ‘Retail Management Training ‘ that preaches ‘Customer is the King’ etc. So they behave with u in a one to one basis & treat u as another person they r dealing with & not a ‘Customer’. So if u r friendly, that is reciprocated & vice versa. Marinated meats & fishes are displayed in front of u & are made on request right in front of u. So there is almost nothing that is made & stored. I was surprised to see that one shop had an automated rotating Chicken Roasting machine too. Our first stop was the shop in the left corner as u enter the gali. We saw kababs on a huge tawa & asked what it was. 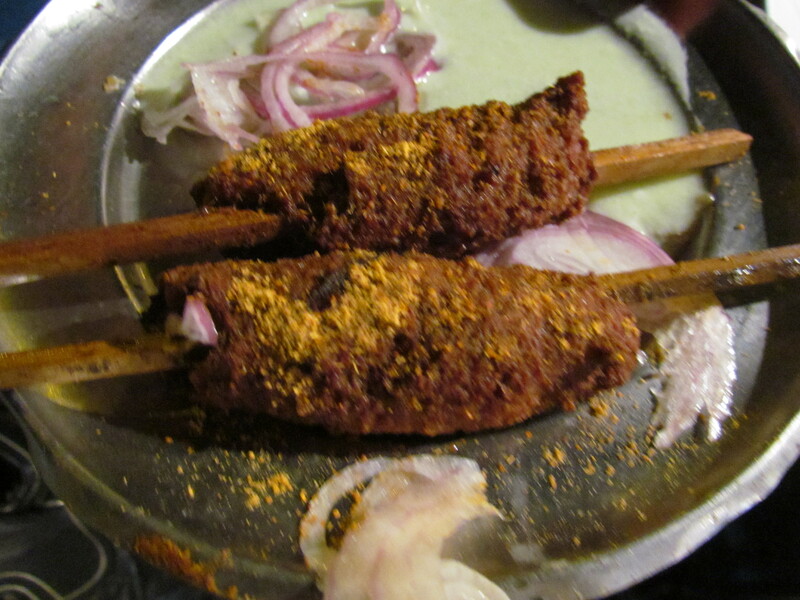 ‘Bade ka Kabab’ came the answer which meant (in case u do not know), Beef Kabab. We said we wanted to have 4 kababs. 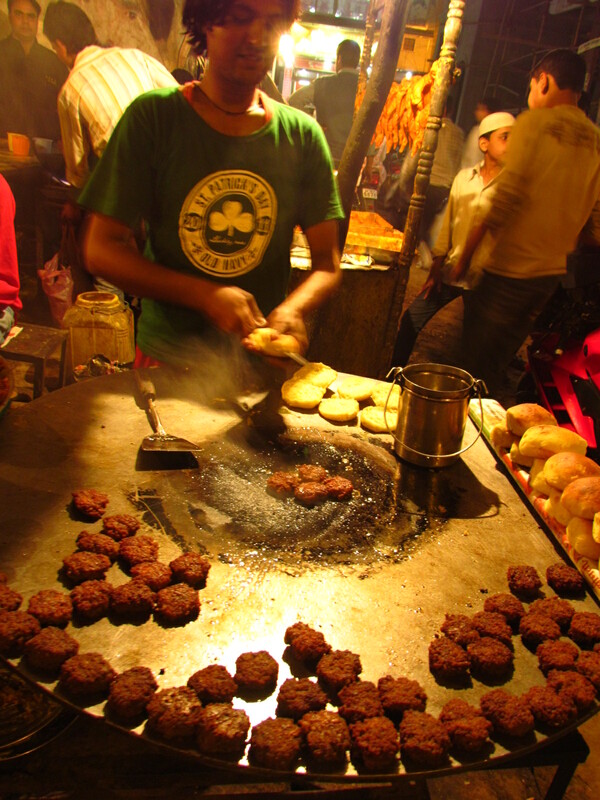 The kababs are made with thickly minced beef – probably by hand & hence uneven in size. So before we understood what was happening, he pulled out four small buns (the size of pao of pao bhaji), cut them in the center & laid them on the tawa. Each kabab was used as a patty in the middle of the pao, topped with a thick green chutney , a sprinkle of a yellowish masala powder & marinated tangy onion slices. So essentially it turned out to be a hamburger Bhopal style. We requested for two patties per bun & he obliged. Once in the mouth, the tastebuds went crazy. They sent constant signals to my brain to ask for more. 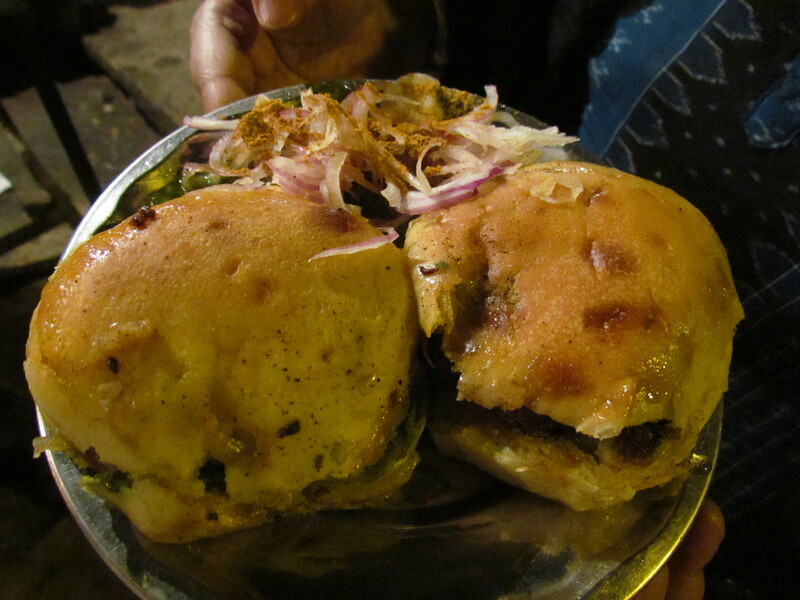 This time they were obliged with just the kababs – They were awesome as it is too. 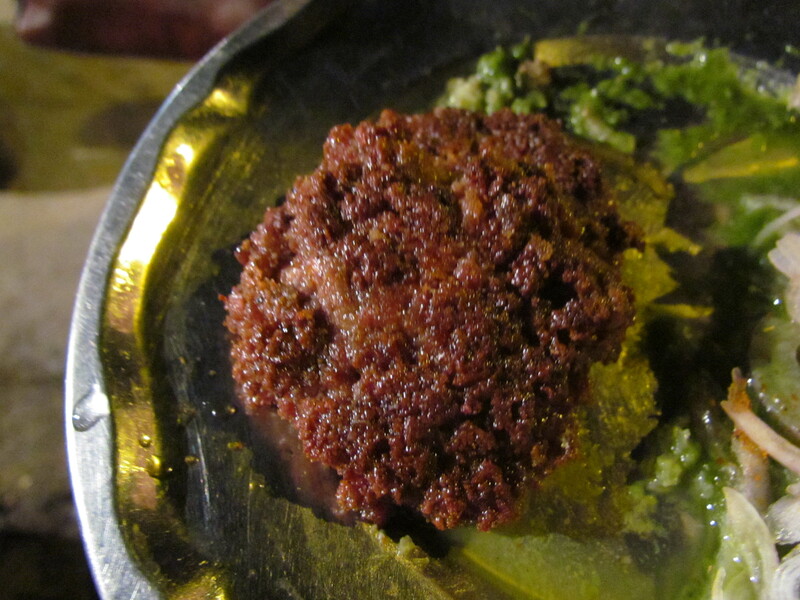 The kababs were juicy, the grains of the mince were large & hence had a statement to make. They were superb in taste, rustic & robust. It tasted good with the bun too, in the form of what I call a Hamburger. This freshly made hamburger was better than most varieties I have eaten so far. I wud surely eat this in all of my visits to Chatori Gali in future. We moved on to mutton sheekh kababs. These are very different from the ones that we r used to in Delhi & Lucknow. These are not soft & melt in the mouth. Rather they r crispy on the outer & soft ‘paste’y inside. Depending on the amount on masala sprinkled, u might find it a bit excess salted – just brush off the extra masala & u will b good. The taste is good & different. I wud come again & ask for such kababs. 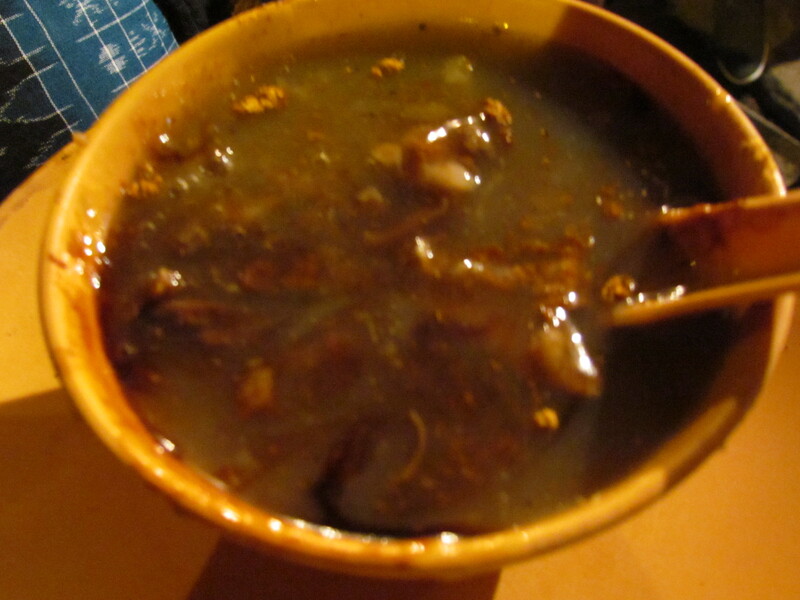 So far we are used to a kind of paya soup which is bit oily, medium to thin consistency & relatively subtle taste. The one at Chatori Gali is exactly the opposite. This is thick ( looked like they had used something like atta or cornflour), has small chunks of meat in it, does not look oily at all, served piping hot & sprinkled with a masala powder!!!! This very different paya soup was good to taste & I wud probably have it again. ………….. & all this at Rs. 72 only. We moved on to the next shop for fried fish. This guy said that the fish comes from Mumbai & other places & generally it is singhara that is used for fries. He was the one with the rotating machine for roasting chicken. He said he got it from the Arab Countries about 5 years back. We had a long nice interesting food ‘chat’. 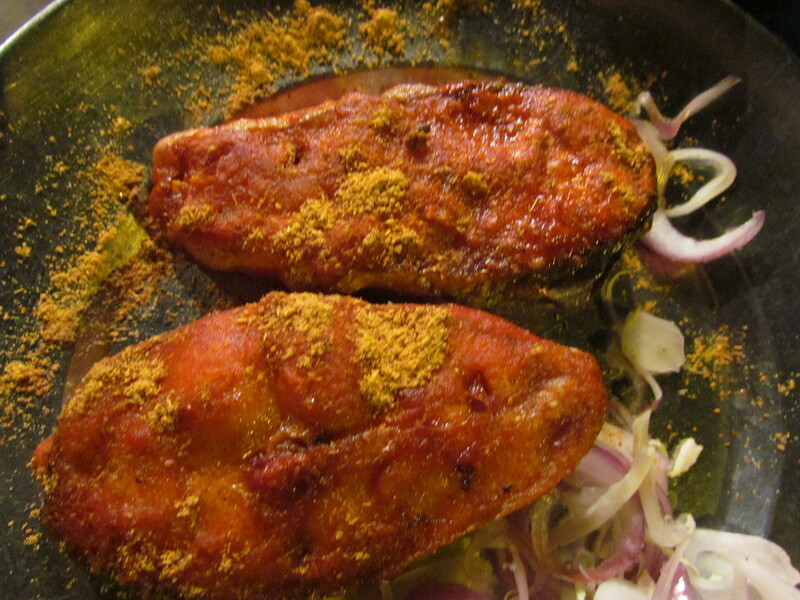 The marinated fried fish was again robust in taste on the outer later & juicy, almost flaky & tasty inside. Loved it…………….. only Rs. 20 for 2 large pieces. 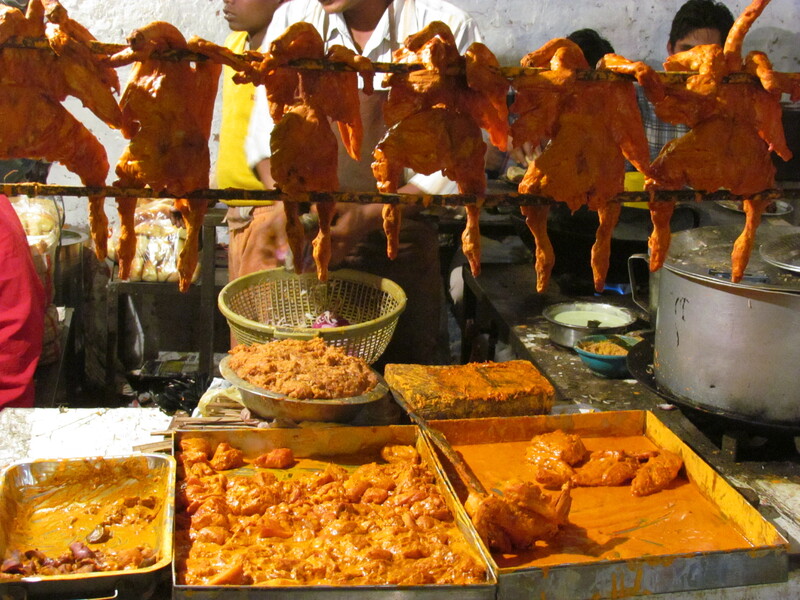 Tandoori Chicken was also available here & served with masala sprinkled on top. Made in front of u after u order it. Fried Chicken aslo sold – Soft, juicy, tangy. Biryani was also available in the gali but we were full by this time – so left it out for the next visit. This Biryani is again different from the Lucknow or the Kolkata variety. The rice morsels in the Bhopal Biryani are not so aromatic or extra large. The meat & the rice is not cooked together here like the kachi Biryani in Lucknow or Kolkata. The meat of the Bhopal Biryani however is as soft & tasty as it can get. Overall – I will keep visiting this gali & keep updating u about it. If u go & eat something that I have not covered so far, pls feel free to write about it in the comments. Previous Post: Fresh Salad with Veggies & Tangy Mayo dressing. 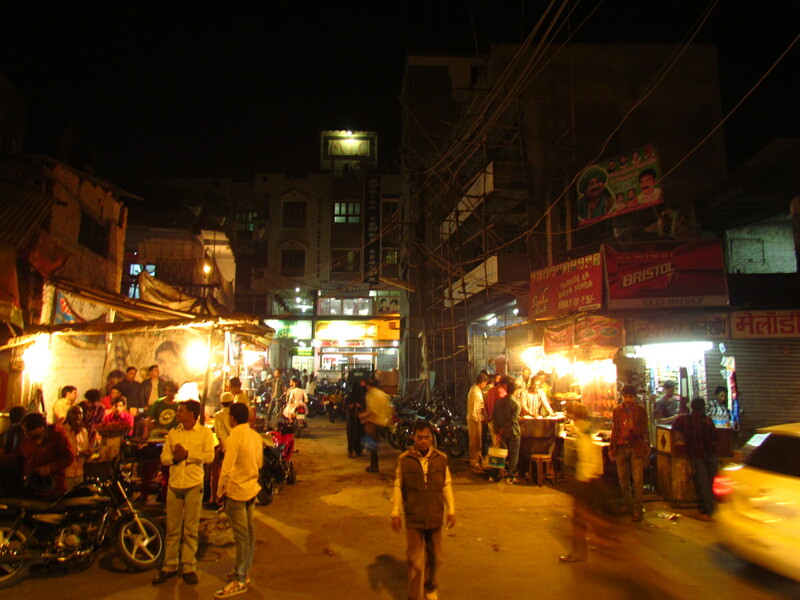 Firstly the pictures… without flash and capturing the true essence of street and the night lighting. I could feel the aroma all over…. 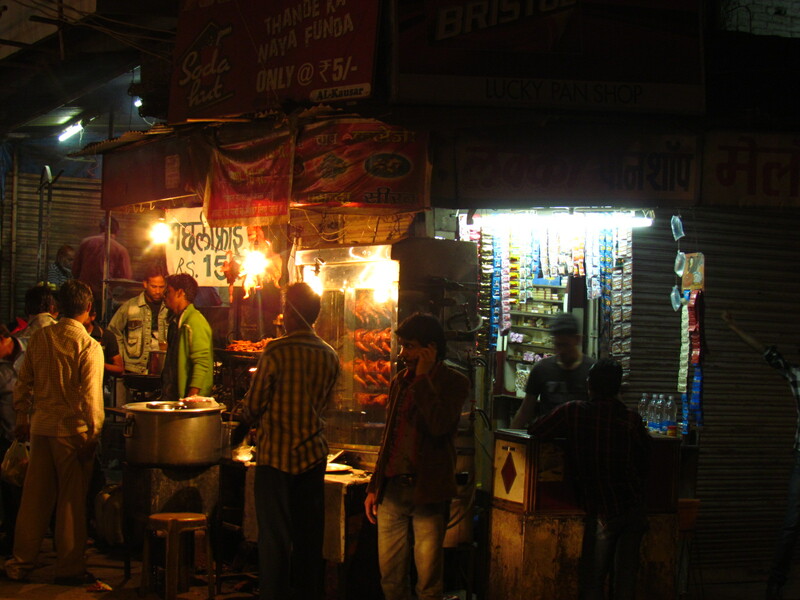 Am always longing to visit the eateries that you write about – genuinely fida! really mouth watering!! would definitely want to try it out once…though would fortify myself with medicines before venturing! i m going to chennai via bhopal ,there i shall check that gali.i have also seen NDTV goodtimes programe and saw Jameel biryaniwala. am going this weekend just to have the beef kebabs 😀 :D,,,, again an awesome review,,, dude u need to contact some channels like Ndtv.. their reviewers can learn a thing or two from u on how to find and review proper food joints 🙂 :0…. Kudos !! try it in case u r in bhopal…..& write back. The kababs were excellent too. i am going to visit Bhopal on 11th July. I will be having time from 10 AM to 1PM . will it be right time to visit chatori gali. As i found your review very interesting . Also want to know the distance of this place from railway station. Does not look like it will b open – It opens in the evenings if I am not mistaken. I have been in evenings only. Wud b great if u cud chk from ur local contact in Bhopal. I have been searching frantically for Bhopal food guide as I would be visiting soon.Thank you for such a detailed story. 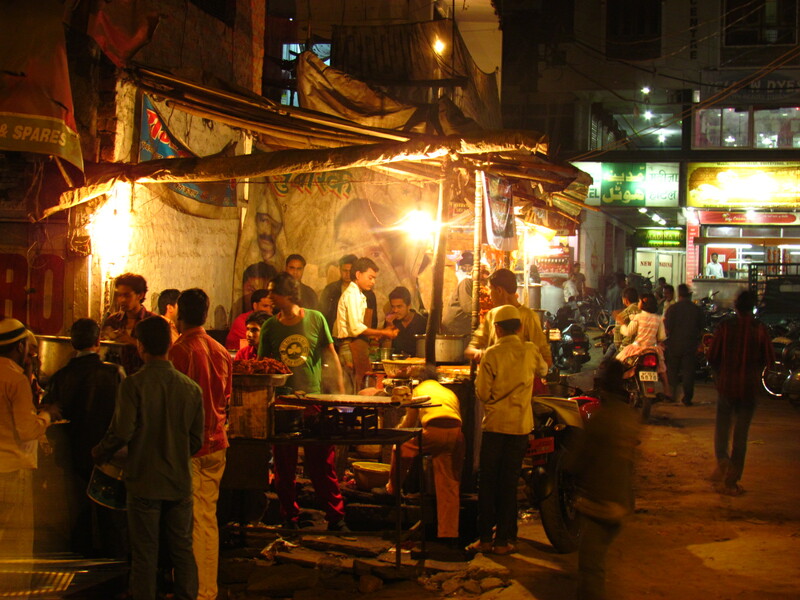 P.S-Can you help me with other ‘food streets’ of Madhya Pradesh. ? hi … i am a vegetarian. is there any thing for me ? 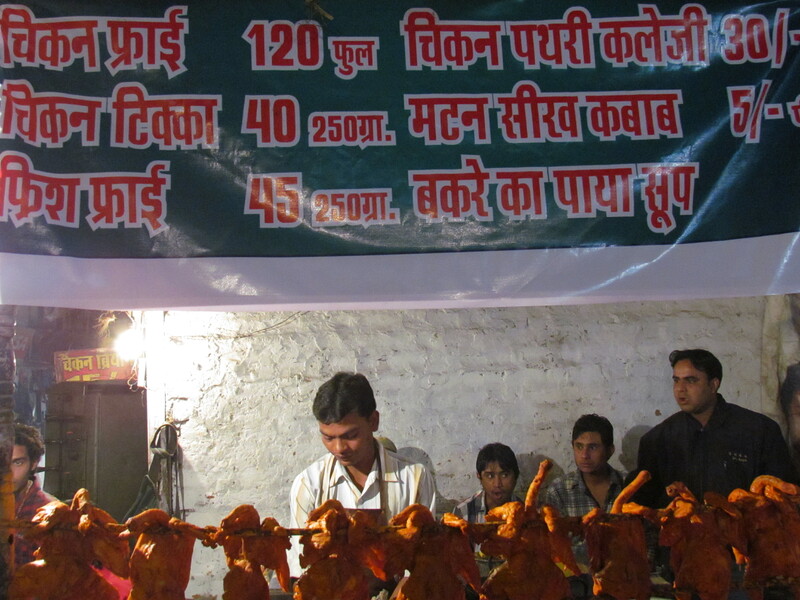 Had 2 leg pieces (250gm) for Rs 70, Beef Bun – Rs 10, Kebab- Rs40 (per plate), Biryani – Rs25. Except the Biryani everything was awsome. The buns were small but its beef patty was the best thing I had. please would you be more specific about adress? 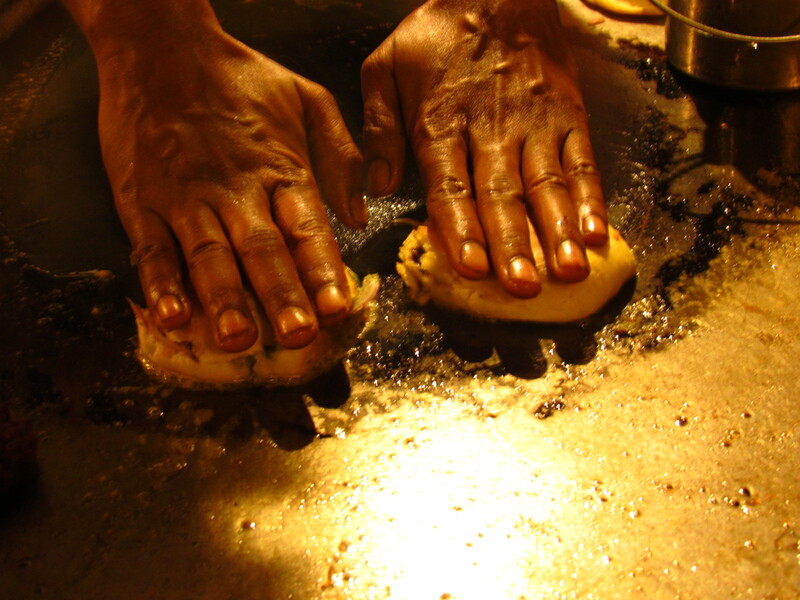 i live in bhopal & i wanna taste humburger. i only know the zamzam where i usually visit.